If you’re in Istanbul, I can’t recommend taking a market tour or cooking class enough. What better way to experience the culture than through its food? Although we didn’t have time to take a tour with Selin, I’m sure it would have been wonderful. Her cooking class certainly was. A native Istanbulite, Selin hosts cooking classes in her apartment, which she has outfitted with a gorgeous cooking nook. We made a feast, including artichoke bottoms stuffed with fava beans and spring onions, baked sea bass with tomatoes, purslane salad, and a bulgur and mung bean salad similar to this. 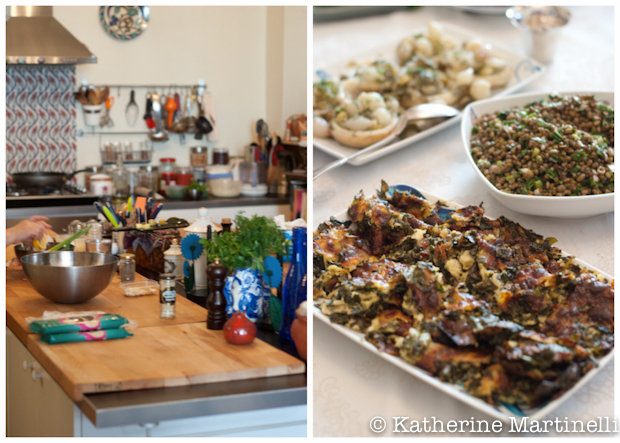 At my request, Selin added Sephardic-Turkish dishes like Spinach “flan” and beef and leek kofte to the menu. For dessert we made baked pumpkin wedges, which we enjoyed with clotted cream. Of course we got to savor the meal we had made at the end and it was one of the best we ate in Istanbul. I was struck by how simple each dish was, and yet how robust the flavors were. Much like other cooking from the region, similar ingredients are put together in a myriad of combinations that result in wildly different and unique recipes. Here, healthful bulgur is cooked and tossed with a toothsome mix of pomegranate molasses, chives, parsley, mint, lemon juice, and olive oil. On it’s own it makes a wonderful light lunch, and it’s the perfect side for a vegetarian or meat-based meal. Bring it to a barbecue or potluck this summer, enjoy it along with grilled chicken, tofu, or kofte. Play around with the fresh herbs you add, add lentils or mung beans for added bite, and adjust it to suit your taste. Pomegranate molasses is readily available these days, but it couldn’t be easier to make. Just put some pomegranate juice (preferably fresh, but bottled works too) in a small pot and boil it until it’s a thick syrup. No sugar, no nothing – just pure, tart pomegranate juice. It’s a brilliant addition to marinades, salad dressings, and grain salads like this. This vegan bulgur salad with tart pomegranate molasses is an excellent introduction to Turkish food. Serve it on its own for a light lunch, or as a side for kofte or grilled meats or vegetables. Parve, Vegan, Vegetarian To make gluten free substitute the barley for another grain like quinoa or wild rice. Love this salad! I made my own pomegranate molasses a few months ago and used it in a marinade but now I’ll have to try this! Beautiful plate! Lovely recipe Katherine, I use Pomegranate molasses to accompany lamb but I will try it in this yummy salad! Travel is just the best inspiration isn’t it? How cool you guys thought to do a cooking class! 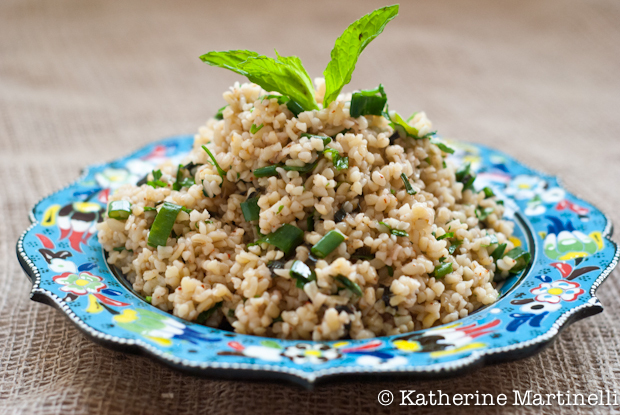 Love bulgur wheat salads, and that pomegranate molasses sounds so good I’ll have to try it. I’ve never tried pomegranate molasses–but it sounds interesting, maybe kind of tangy? What a great-looking salad! what a fantastic salad! sounds delicious! I’m quite envious of your Turkish food experiences: one country to which my travels have not taken me. Love the salad: simple but so different! And I always have pure pomegranate juice in the pantry these days: now why didn’t I think of these molasses? 🙂 ! When I blearily first read this this morning on my iPhone I thought it said Burger Salad with Pomegranates. This makes much more sense! And sounds much better quite frankly! Bulgur may sound humble but it is full of flavors especially if you combine it with pomegranate! This article is such a coincidence, I am organizing a culinary trip to Athens during September doing exactly what you din in Instambul, only this one will have cooking classes with a chef, wine tasting and sightseeing. It is always great to hear the experience of someone who has done something similar! You have turned a humble dish to such a fine creation. I love pomegranate molasses – thank you for sharing how to make it! I’m sure it adds such a pop of flavor to this salad. I love its simplicity. I love bulgur salads, and your looks amazing!! Your Istanbul trip turned out to be a real goldmine! Thanks for sharing so much with us. Nice, scrumptious looking recipe. I confess, I’ve never juiced a pomegranate before. Am I sheltered or what?! But I’ve got a project coming up where I need some pomegranate juice, so I guess I’ll be learning (actually it appears to be dead easy). I have cooked with pomegranate molasses, but it’s been years. A decade ago (at least) one of Paula Wolfert’s books used it in a lot of recipes, so I got some to try those. Great stuff. So I might be making some of that, too! Good post – thanks.